Shortly after the launch of Operation Iraqi Freedom, the war in Iraq became the most confusing in U.S. history, the high command not knowing who to fight, who was attacking Coalition troops, and who among the different Iraqi groups were fighting each other. Yet there were a few astute officers like Lt. Col. Christopher Hughes, commanding the 2d Battalion of the 327th Inf. Regiment, 101st Airborne, who sensed the complexity of the task from the beginning. 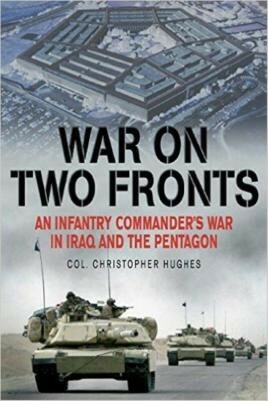 In War on Two Fronts Col. Hughes writes movingly of his No-Slack battalion at war in Iraq. The war got off to a bang for Hughes, when his brigade command tent was fragged by a Muslim sergeant in the 101st, leaving him briefly in charge of the brigade. Amid the nighttime confusion of 14 casualties, a nearby Patriot missile blasted off, panicking nearly everyone while mistakenly bringing down a British Tornado fighter-bomber. As Hughes' battalion forged into Iraq they successfully liberated the city of Najaf, securing the safety of Grand Ayatollah Sistani and the Mosque of Ali, while showing an acute cultural awareness in doing so that caught the world's attention. It was a feat that landed Hughes within the pages of Time, Newsweek and other publications. The "Screaming Eagles” of the 101st Airborne then implemented creative programs in the initial postwar occupation, including harvesting the national wheat and barley crops, while combating nearly invisible insurgents. Conscious that an army battalion is a community of some 700-plus households, and that when a unit goes off to war the families are intimately connected in our internet age, Hughes makes clear the strength of those connections and how morale is best supported at both ends. Transferred to Washington after his tour in Iraq, Hughes then writes an illuminating account of the herculean efforts of many in the Pentagon to work around the corporatist elements of its bureaucracy, in order to better understand counterinsurgency and national reconstruction, which Lawrence of Arabia characterized as "like learning to eat soup with a knife.” To read this book will help understand the sources of mistakes made—and still being made—and the process needed to chart a successful strategy. Written with candor and no shortage of humor, intermixed with brutal scenes of combat and frank analysis, this book is a must-read for all those who seek insight into the current war in the Mideast. Chris Hughes' book certainly has that edge, for his book covers not only the business of war at the sharp end, but also the realities of exercising leadership during a clash of cultures and ideology that at times are miles apart. The book will appeal to a variety of readers on many levels. Students of contemporary defence issues and those interested in the role of a present day commander in the field and in the practice of modern warfare will find much to enlighten them. A first-class, personal account of combat in Iraq and how bureaucracies wage war. . . . War on Two Fronts makes real contributions to understanding battalion command in both conventional and unconventional operations, and to understanding the essence of full spectrum operations. … a very clearly written appraisal that affords more than the usual perspective on what kind of cleaning up in the Pentagon will be needed when the war and the Bush administration have passed into history. Definitely valuable to serious students of defence issues. Hughes offers an insightful review of our problem in Iraq as a loyal supporter of President Bush...His book becomes genuinely thoughtful as he concludes that, while America was absolutely right to invade Iraq to depose an evil dictator, our ignorance of that nation 's history and religion has led to chaos. This battle narrative gives a clear and candid overview of how a leader deals with combat. . . . Likewise [Hughes] is clear about what he feels the strengths and successes of the army are, both in Iraq and institutionally. . . . Recommended.